Currently, the evaluation of sediment storage and transport for large river systems with variable flow has proven to be a challenge that often requires complex numerical models to be applied and sometimes costly direct data acquisition to be made. The present study proposes a low cost, widely available GIS-based method through which an initial assessment can be made on areas of sediment storage, transport and deposition as well as possible environmental risks that the accumulation of contaminated material may pose to riverine communities along the rivers’ channel. The method mainly relies on satellite imagery and elevation data to devise a quick model of the channel. The model has been successfully applied to study the Bolivian sector of the well-known mining-contaminated Rio Pilcomayo. The analysis shows that the portion of the channel from Villamontes to D’Orbigny accounts for more than half of the total c. 314 km2 sedimentation area of the Pilcomayo in Bolivia, and that the most environmentally problematic area is centreed around Puente Sucre, where agriculture is practiced on the contaminated floodplain. 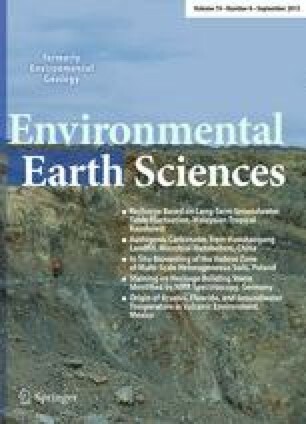 Combined with supplementary bathymetric data on the depth of the river in various points around the channel the method could offer further insight into the sediment fluxes and transport capacity of the Pilcomayo in various sectors and could thus be successfully used to assess other large mining-contaminated river channels around the world. We are grateful to Patrick Byrne for helpful discussions and constructive suggestions that improved the manuscript.